Champion juvenile filly Champagne Room will be sidelined at least 90 days after having surgery to remove an ankle chip March 8. Phil Bongiovanni, who co-owns Champagne Room and races her with Gulliver Racing, told the BloodHorse late Wednesday that the 3-year-old daughter of Broken Vow had a small chip removed from her right front ankle. Bongiovanni said that Champagne Room came out of the surgery well. Bongiovanni also indicated that the filly's ownership group hasn't decided if she will continue her racing career or if she will possibly be bred and sold later in foal. 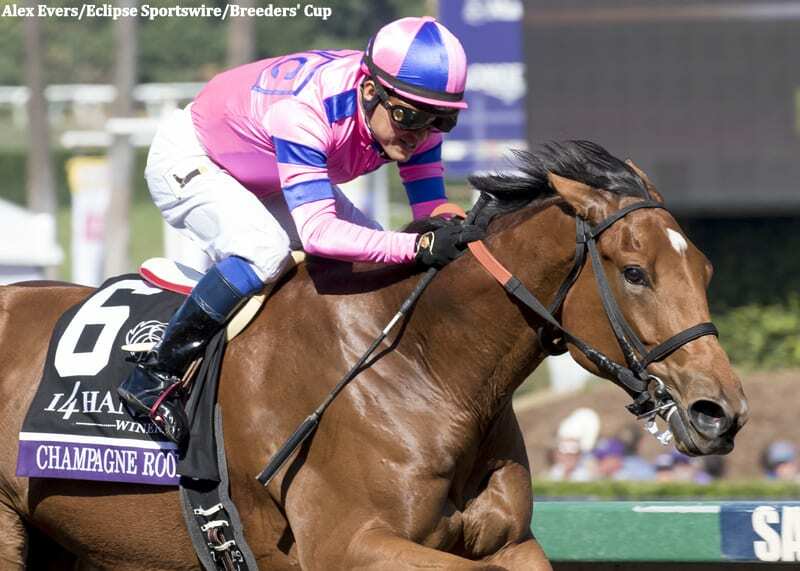 This entry was posted in NL Article, Racing and tagged breeders' cup juvenile fillies, Broken Vow, champagne room, Horse Racing, peter eurton, thoroughbred by Paulick Report Staff. Bookmark the permalink.